Rab Argon Pants. 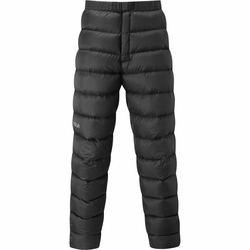 The Argon Pants are filled with the highest quality 800FP ethically sourced European Goose Down. Designed to be worn over a baselayer, the Argon offers extra comfort and warmth around basecamp, in a bivi or to increase your sleeping bag's performance. They pack down nice and small, and the provided stuff sack makes it a no brainer to carry them with you on your expedition, providing you with a boost of warmth when you need it most. Technical features include a tough and durable Pertex Microlight outer, stitch through construction to eliminate cold spots and a 2-way front fly zipper.